Click here for details on the March 19, 2019 fatal motorcycle crash in Gorst. An early morning crash in Gorst took the life of one person on November 19th. Two of the vehicles had been traveling in the westbound lanes, and the other two were headed east at the time of the collision. Debris from the crash stretched for more than 100 yards and all four vehicles were heavily damaged. The man who died in the collision was Delyle Edgar Machacek, a Belfair resident. One of the other drivers was injured in the collision and taken to St. Anthony’s Hospital for treatment. Trooper Russ Winger of the State Patrol stated that the at fault driver has been arrested for vehicular homicide. Police believe that alcohol may have been a factor in the crash. 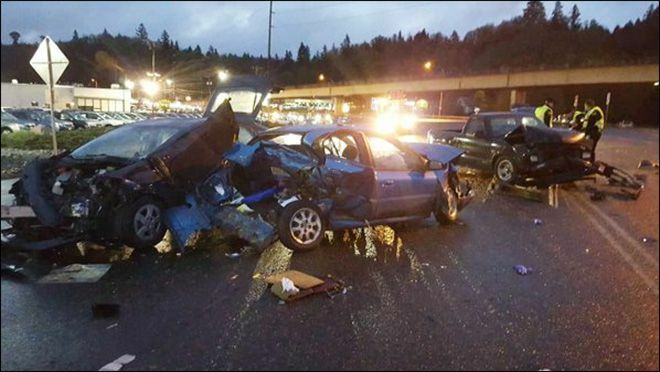 42% of all fatal motor vehicle crashes in Washington State involve a driver who was under the influence of alcohol at the time of the collision. Drunk drivers who cause injuries or deaths in Washington State can face criminal charges, including vehicular assault and vehicular homicide. They may also be sued for civil damages by the people they injured or the families of the people they killed. Victims of a drunk driver can recover some damages through the Washington State Crime Victim Compensation Program. This program can pay for funeral expenses, grief counselling, medical bills and some other damages caused by violent crimes. Although some people believe that the fines that a drunk driver pays when they are sentenced in a criminal case will go to the victims, this is not actually the case. Victims of drunk drivers who need to recover monetary damages need to file a civil case, possibly with the help of a personal injury attorney who specializes in drunk driving cases. Davis Law Group has created a pamphlet with information for the victims of drunk drivers in Washington State. You can request it for free here.